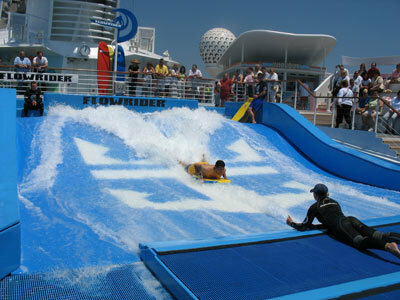 In its decision of December 20, 2011, the Court of Appeals for the Eleventh Circuit ruled that the waiver, signed by Charlene Johnson, a Cruise passenger, before injuring herself while using the on-board attraction Flowrider, was unenforceable, and the injured passenger was no longer barred from bringing her personal injury claim against the Cruise Line for its negligence. Charlene Johnson was a passenger on the Oasis of the Sea cruise ship owned by Royal Caribbean Cruise. Mrs. Johnson wanted to ride the Flowrider, a simulated surfing and body boarding activity located on the ship. Before Charlene Johnson, or any passenger, could ride the Flowrider, she was required to read and sign her name to an electronic “Onboard Activity Waiver”. By signing such waiver, Charlene Johnson agreed to waive her rights and release Royal Caribbean Cruises, Ltd., and its employees from legal actions “arising from any accident or injury resulting from her participation in any and all of the shipboard activities she selected” (including the Flowrider). In other words, Charlene Johnson agreed to waive her rights to file a lawsuit against the cruise line and its employees should she injure herself while using the Flowrider. After she signed the electronic waiver, Charlene received instructions on how to ride the Flowrider on a body board. The instructor who was supervising Charlene told her to stand on the body board, which was a clear deviation from the regular use of the body board and the cruise line’s policies. Royal’s safety guidelines for the Flowrider attraction clearly state that only the surfing boards can be stood upon, while the body boards should only be used while lying down. Upon receiving instruction to stand up on the body board, Charlene stood up and when the instructor let go of Charlene’s hand, she fell and fractured her ankle. A lawsuit was filed soon thereafter against Royal Caribbean Cruises, Ltd. The cruise line moved for Summary Judgment arguing that Charlene Johnson had signed a waiver that precluded her from suing Royal and from recovering from her injuries. The plaintiff argued that Federal Statute 46 U.S.C. §30509, which prevents a shipowner from contracting away its liability for negligence, should apply to her case and render the waiver unenforceable to her claim. In a decision of March 18, 2011, Judge Moreno, Chief Judge in the Southern District of Florida, ultimately agreed with Royal’s argument and dismissed Charlene Johnson’s case. The Court determined that the case did not fall within the General Maritime Law and therefore the Federal Statute did not apply. After hearing the case on appeal, in a decision published on December 20, 2011, the Court of Appeals for the Eleventh Circuit agreed with Charlene Johnson and reinstated her personal injury claim. The Court of Appeals disagreed with the lower court for failing to look at the plain and unambiguous language of the statute and failed to apply it to the facts of this case. The Court of Appeals determined that the waiver at issue is a contract that limits the liability of the shipowner for personal injury or death caused by the negligence or fault of the owner or the owner’s employees or agents. Because the waiver in question contains no exception regarding the type of activity in which the passenger is participating when the injury occurs, the waiver is deemed invalid on its face under Federal Statute 46 U.S.C. §30509. The Eleventh Circuit’s ruling clears the way for future cases where Plaintiffs signed a waiver to participate in an on-board activity. By rendering these waivers unenforceable, passengers, who sustain an injury because of the negligence of the shipowner or its employees, are no longer precluded from filing a lawsuit even if they have signed a waiver. The Law Firm of Leesfield Scolaro represents individuals and families who have been injured while on a cruise ship. For over 35 years, our Cruise Ship lawyers have served those areas in and around Miami and South Florida (Miami-Dade, Monroe, Broward and Palm Beach County) as well as nationwide. If you or a person you know have sustained an injury while on a cruise ship, contact one of our experienced Cruise Ship personal injury attorneys at 800-836-6400 for a free case evaluation.